Venture has changed the way it builds the 39 series, including center console, forward seating, tournament, and cuddy models, to craft a better boat. The Venture 39 is not a new design, but as you already know if you read our review of the Venture 34, this company is known for building tricked-out, high-tech fishing machines. Recently, however, Venture changed hands. And with Lee Heaton taking the helm, tricked-out and high-tech wasn’t good enough anymore—these boats had to become stronger, faster, and more customized. The mission to update and re-create the Venture line began with the 39 series, introduced to the world at the 2013 Fort Lauderdale Boat Show. How do you make high-tech higher, when it comes to building boats? For starters, maintain the extensive use of top-notch materials, including Kevlar, Divinycell PVC foam cores, and vinylester resins. 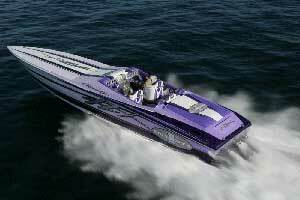 Then reinforce the ceramic matrix-cored transom, to up the max power from 1,050 horses to 1,200. Next, instead of bolting the console in place as had been done for years, make the joint fully glassed. Stop bolting the cap over the hull to deck joint, and instead, vacuum-bag it and glass it together. Then start paying more attention to the details—in a big way. 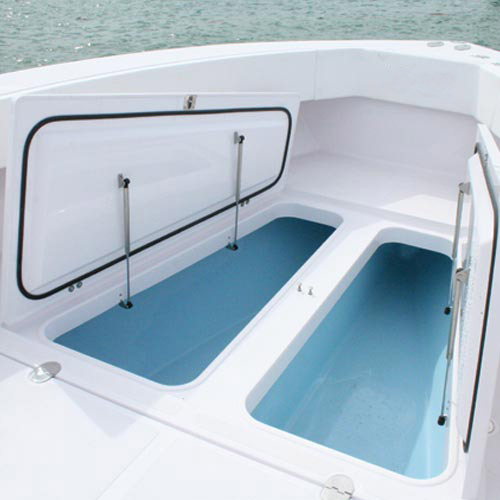 The stowage and fishbox hatches provide a perfect example. Instead of being produced en mass for the entire line, each and every individual hatch is crafted and fitted for each and every individual compartment, on every single boat. Since each hatch is custom-fitted for each compartment, they have much tighter tolerances. That eliminates ill-fitting lids, leaking seams, and creaks and groans when you walk on them. Venture also wanted to make the 39 series, which includes open center console, forward seating, tournament, and cuddy models, more customizable. To this end, they moved production to American Custom Yachts in Stuart, Florida, and Venture started offering some new options. As in, lots of options. The list is too long to include here, but a few of the highlights you can choose from include goodies like full-size coffin boxes, Optimus 360 outboard joystick steering controls, a hullside dive door, underwater lighting, and multiple custom top and tower designs. 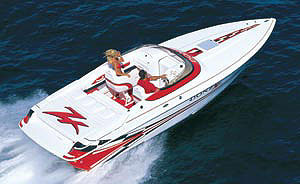 Naturally, just how crazy you get with customization does have a huge affect on the boat’s price tag. For the stock boat (if there is any such thing) it ranges from the low $300,000’s to the high $300,000’s depending on power and model options. But adding in a slew of those custom touches could drive the price up significantly. More about the options you face when ordering the Venture 39: it can be had with twins or triple outboards, and although getting this boat with just two eggbeaters on the transom might seem a bit timid, it actually still has excellent performance. 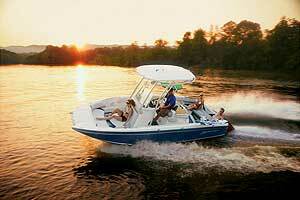 Top-end with a pair of Yamaha F350 four-strokes is around 54 MPH, and a 35 MPH cruising speed nets you about 1.1 MPG. With triples you’ll naturally have a higher initial cost (to the tune of about $30,000), while top end only jumps up by 10 MPH. Considering that 54 MPH is already eye-watering fast for running through the open ocean, does this mean the savvy boater will opt for twins? Nope. While single engine outboard rigs are commonly more efficient than twins, adding the third engine and its accompanying drag doesn’t cause a similar efficiency loss. In fact, in many cases since the engines aren’t working as hard to attain similar speeds, at cruising speeds the triple-engine boat is actually more efficient than an identical one with twins. The Venture 39 is just such a case. Add the third F-350 onto the transom, and at 35 MPH the boat’s MPG actually jumps from 1.1 to 1.2 (at 3500 RPM, while burning 29.4 GPH). That’s obviously not a huge difference, but if you can get the extra power and the additional top-end—for those few days you’ll want or need it—without sacrificing efficiency at cruising speeds, why not do it? Okay: so you’re zooming around the ocean on your brand-spankin’-new uber-cool, semi-custom, high-tech fishboat. How will you fare when you get where you’re going? No surprises here—the Venture 39 is rigged up and ready for some hard-core offshore action. It has a tackle center in the leaning post, a 55-gallon livewell in the transom, six rodholders in the gunwales (more can be added), fresh and raw water washdowns, and a transom rigging sink with fresh and raw water. Fishbox capacity changes depending on the lay-out you choose but in any case it’s copious. And IMHO if you get the open version, you hope to slay monsters like tunas and swordfish, and you don’t opt for the coffin box, you’re nuts. 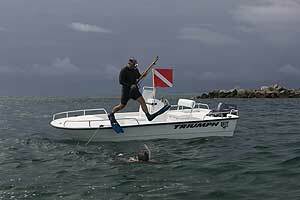 Is the Venture 39 rigged to fish? A glance at the back of the leaning post leaves no doubt. So far the Venture 39 sounds like a pretty cool boat. And it should. But let’s get real—there’s no such thing as the “perfect” boat, and they all have their down-sides. So, what’s the weakness here? Let’s circle back to cost for a moment. Just out of curiosity (and maybe a bit of fantasy) I sat down with the price sheet for the 39 open and a calculator, and added up everything I’d get if I were buying this boat tomorrow. I came up with $433,350 without adding in a tower or joystick steering, since the price for these can vary. And, I do want them. So obviously the boat would be pushing the half-a-mil mark. Ouch. Other than cost, however, I didn’t see much to beef about with this boat. 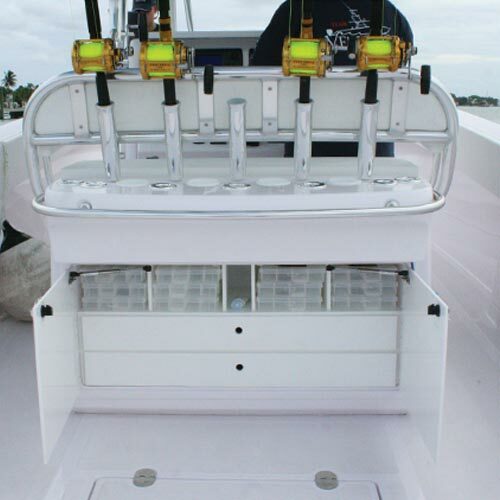 Naturally you’ll have the issues common to almost all outboard-powered fishing machines of this size and nature—difficulty working fish around those far-aft lower units, harmonics that don’t stack up to those of diesel inboards when trolling for billfish, and a relatively restrictive length-to-beam ratio as compared to inboard sportfishers of this size, for example. But otherwise, when I poked through this boat I just didn’t find the usual stuff to complain about. While it’s been sad to see so many boat companies change hands or just plain disappear in the modern economic climate, one of the benefits is that new blood comes into the fold. New ideas pop up, and new energy goes into the boats being built. Suddenly, merely being tricked-out and high-tech isn’t good enough anymore. 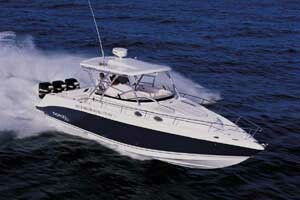 And as a result, we get new and improved boats—like the Venture 39. Other Choices: The Hydra-Sports 4200 SF is another monster-sized outboard fishboat that posts highway-style speeds and is built with high-tech materials. The same is true of the Deep Impact 399 Center Console, though this boat is inclined more towards performance—claimed top-end is 78 MPH—and less towards hard-core fishing. See Venture 39 listings. For more information, visit Venture. 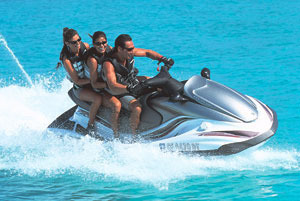 Power Triple Yamaha F-350 four-stroke outboards, swinging 15.5" x 21" three-bladed stainless-steel props. Performance data provided courtesy of Yamaha. 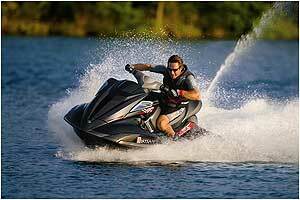 Power Twin Yamaha F-350 four-stroke outboards, swinging 15.5" x 21" three-bladed stainless-steel props. Performance data provided courtesy of Yamaha.